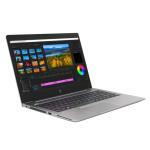 HP ZBook 14U G5 Core i5-8350U 256GB 14in Expert Reviews - Read Reviews and Buy Smarter Online. Verdict: The HP ZBook 14u G5 is a 14-inch mobile workstation that fulfills the criteria of being a workstation thanks to its fast CPU and its professional standard GPU. The package is rounded off with many security features and a fast NVMe SSD. Verdict: IT IS IMMIDEATELY EVIDENT JUST WHAT A GREAT COMPUTER MY NEW ZBOOK IS. FROM ALL APPARENT AND NONAPPARENT STANDPOINTS. A STRONG, FAST, STURDY.LIGHTWEIGHT DEVICE THAT DOES THE WORK IMMEASUREABLY WELL.IM VERY PROUD OF THIS MOBILE WORKSTATION LAPTOP.